Ray Tomlinson died on Saturday morning. You may have heard of him, but I'm guessing most of you probably haven't. He is credited with inventing email, back in 1971-1972. I checked several sources and they couldn't seem to agree on an "exact" date. Technically, email evolved from a very common idea, no more complicated than leaving a stick-it note on a colleague's desk. A file was sent (or placed) in a specific folder on a computer so that the user's attention would be drawn to that file the next time s/he logged in. Much has changed about email in the intervening 45ish years... except for one particularity: Tomlinson chose the @ symbol to address emails: name-of-user@name-of-the-computer. Today, it is name-of-user@name-of-ESP. Cliché but true: "the more things change, the more they stay the same." Just a few short years later, 1995, my husband went to visit our future home in Africa. We emailed exclusively to communicate - using the address of the middle school library of the school where I was then teaching with my name in the subject line. I still have those emails somewhere in a box, printed out. One specific thing I remember about that particular season? It wasn't at all unusual to hear people refer to the Internet as a tool of the devil. As we began raising our support to head overseas, all official correspondence was still done via the post, but that was rapidly changing, too. Within a few years and by the time we'd moved out of the States, Yahoo Messenger chatting was our informal mode of communication; emails, with the exception of our regular paper prayer letters, had become our most frequent mode of contact with anyone at the official or business level. Our communication styles have continued to evolve. Sometimes, it is age/generation dependent: I tend to rely on blogging, Facebook and texting; our kids like Tumblr, SnapChat, Pinterest, Instagram and, of course, texting. I'm still trying to figure out Twitter - sort of. I guess I haven't bothered to spend too much time on it because to date, it hasn't been necessary. Hubby, on the other hand and even though he's tons more techie than myself, still prefers to pick up a phone. Very occasionally, I'll choose pen and paper and write an actual letter. Seems even rarer to receive one, but it is always a treat. What I've described is probably pretty comparable to what anyone my age has lived - missionary/expat or not. Of course, living on the back side of the desert sometimes meant that electricity and internet service couldn't coordinate well enough to both be working at the same time... but those were, generally, short seasons. Our prayer letters are sent via MailChimp - although we do still send a hard copy quarterly for the 200ish folks that still remain on that list. That number is down from 600ish when we first started this journey. I wonder how we'll be passing information back and forth just a few years down the road. How have your communication styles evolved? 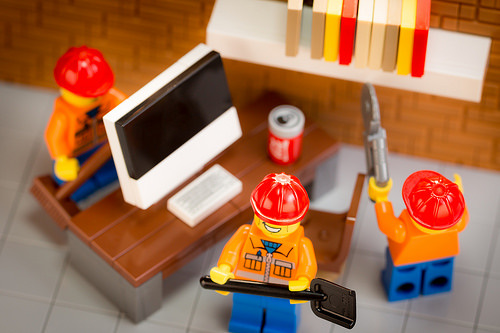 Do you look forward to these changes, whatever the next one will be... or do you dread them? How do you typically communicate with family? Friends? Local colleagues? Ministry partners back in your home country or otherwise physically far away? 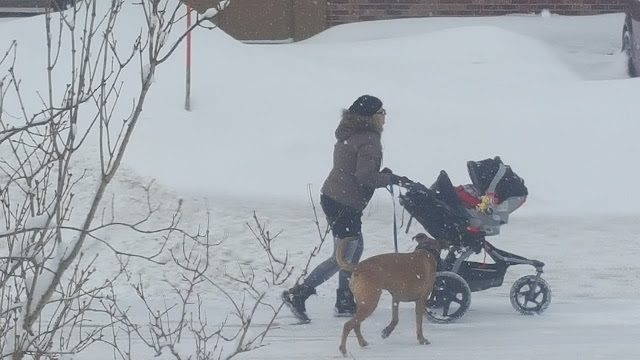 You can't really see it, but just before I snapped this picture, she was doing something on her smart phone... in a just shy of blizzardish snow storm... while walking her dog and taking the baby for a stroll. It is available - what we use is so dependent on what our friends are using, isn't it? Words, Words... and more W.O.R.D.S!